A rescue team will be throwing open its doors next week to give the public a behind-the-scenes look at their work. The Cave Rescue Organisation’s base in Clapham, in the Yorkshire Dales, is the venue for a day of activities aimed at families during the school holiday. Catherine Kemp, the Yorkshire Dales National Park Authority’s outreach officer, said: “There will be lots of games and activities for children – and for adults it’s an opportunity to see what happens when someone needs help on the hills and in caves. The free day of activities is suitable for children aged five and above, but they must be accompanied by an adult. The rescue team operates both above and below ground in the western Dales. This year its volunteers have been called out 32 times so far, to incidents as diverse as rescuing sheep from potholes to dealing with the casualties from a light-aircraft crash on Ingleborough. Rae Lonsdale, one of CRO’s duty controllers, said: “We take our work seriously in CRO, but that doesn’t mean we take ourselves too seriously. We’ll be having a bit of fun with a quiz, some rope-work, a bit of safety education and an exploration of one of the team’s Land Rovers. Malcolm Petyt, the authority’s member champion for recreation management, said: “We want families to get active and be healthy in the Yorkshire Dales national park. 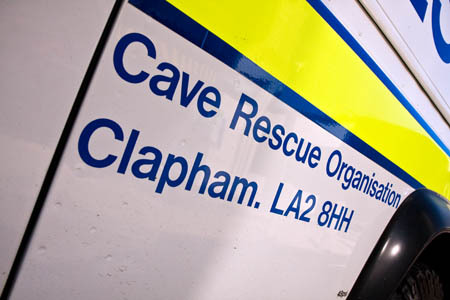 There is no charge for the event but donations towards the work of the Cave Rescue Organisation will be welcome. The open day will take place on Wednesday, 1 June, from 11am to 3pm. The headquarters are in the centre of Clapham, next to the New Inn. The CRO will also be taking part in the Ingleton Overground Underground outdoor festival. On Saturday, chairman Jack Pickup will introduce the film What a Way to Spend a Sunday, which follows six cavers on the through trip from Simpsons Pot to the Kingsdale Master Cave. This will be followed by Geoff Yeadon presenting Underground Eiger which shows him and Oliver Statham on their caving journey beneath Ingleborough. The evening is rounded off with a showing of The Asgard Project, Al Lee’s fascinating film of Leo Houlding’s ambitious free ascent of a route on Mount Asgard’s north face. Details are on the Overground Underground website.